In a comment on "The most Trumpish (and Bushish) words", D.O. wrote "It seems that we are missing (at least I was missing) a key piece about Mr. Trump's and Mr. Bush's speaking style. Mr. Bush is using significantly more words than Mr. Trump". What he means is not that Bush talks more than Trump — in fact, the opposite is true. Thus Donald Trump's announcement of his presidential run totaled about 6,400 words, whereas Jeb Bush's announcement racked up less than 2,300. 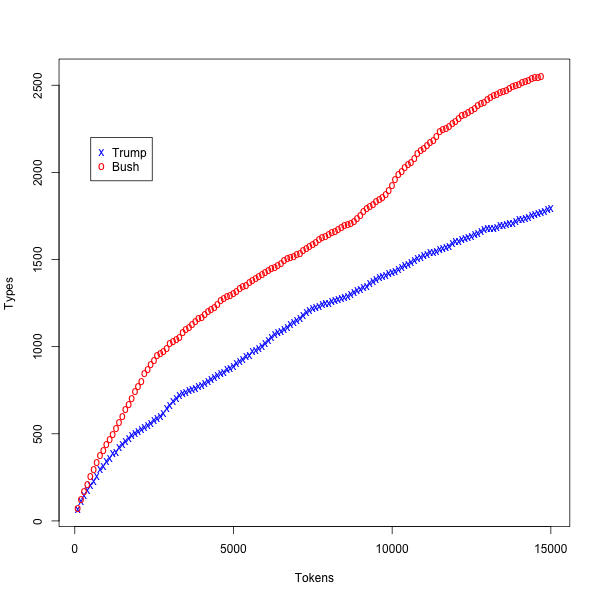 In the first Republican presidential debate, Trump contributed more than 1,800 words, while Bush contributed less than 1,600. One factor to consider is that Trump's "texts" are all extemporized, while two of Bush's texts (his announcement and the 8/11/2015 speech) were delivered from a written version. Still, I suspect that even if we limited consideration to transcripts of extemporized speech, there would be a (smaller) difference of the cited kind. I need a Bush-Bush comparison to calibrate the device. Yes, this is more or less what I meant. Of course, what Prof. Liberman calls "types" would better be represented by lexemes, but distinct tokens is good enough. The plot that Prof. Liberman published in OP is, I believe, showing cumulative number of distinct tokens vs. the number of tokens uttered so far in some natural progression of speech. So, roughly and loosely speaking, it is the vocabulary display progression with time. In addition to numerical differences, we see that Bush's curve has 3 very distinct intervals. Maybe this is because of the mixture of the types of the speeches used. (showing that Mr. Bush adheres much stronger to Zipf's law? ), but Mr. Trump really likes his first 2 to 3 hundred (distinct) words and then doesn't mind to use how much vocabulary is needed to say what he wants. Now I wonder, how would Trump compare to Rudy Noun-Verb-9/11 Giuliani? I hope there will be at least one linguistic benefit to emerge from Donald Trump's campaign. The revival of the now-rarely heard fine old English word, "trumpery". The man embodies the concept so precisely, it seems he wants to see his picture in the dictionary, as well as in all the tabloids.